The Walls Are Talking: Former Abortion Clinic Workers Tell Their Stories, is Abby Johnson’s second powerful exposé of the abortion industry. A collection of personal testimonies from those who have left the abortion industry, it is a book of woe: broken hearts, dead children, mistreated women and abortion workers whose consciences were systematically seared and hardened to the gruesome realities of the work they did every day. This book is a must read for every pro-life activist, for every feminist, for everyone who loves women and children, and for anyone who cares about the issue of abortion (for or against) but has never themselves worked day-to-day in the abortion industry. 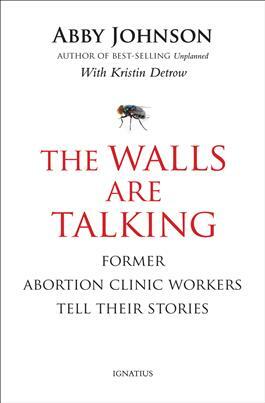 The Walls are Talking rips away the dark, suffocating shroud of secrecy surrounding daily operations inside abortion and pro-abortion family planning clinics and lays the facts bare for readers to evaluate themselves. Despite the grim tone of the stories, however, this book is ultimately a narrative of hope. Abby Johnson is a former abortion clinic director. In 2008 she was Planned Parenthood Employee of the Year. She left her job at Planned Parenthood in 2009 after participating in an ultra-sound guided abortion and witnessing the baby fight for his life and die. Since leaving Planned Parenthood, Abby founded And Then There Were None, a ministry dedicated to helping abortion clinic workers leave the abortion industry. Abby’s insights into the issue are unparalleled and her knowledge and experience are exhibited in the stories selected for this book. The diversity of perspectives graphically illustrates how evil oozes out of every pore of the industry. Abby’s prudent selection of stories provides a comprehensive literary construction of the pit of despair into which women fall when they desperately seek help with an untimely pregnancy or find themselves entangled in employment in the abortion industry. Most importantly, each story ends with a message of redemption. The first sentence of the preface is, “This will not be an enjoyable read.” It’s an accurate statement. I would add this caveat: don’t read this book before you go to sleep at night. I was excited when I heard the book was being published. Despite a bit of a slow start, it did not disappoint. After receiving my copy I finished reading it within 24 hours. It is page after page of unspeakable trauma and atrocity, interspersed with narratives of the slower-paced, systematic seduction into ever-deepening denial that the reader takes with clinic workers as their consciences are slowly deformed so that no amount of evil can upset them any longer. I have a greater appreciation for the circumstances that lead someone to work in the abortion industry now. That empathy makes me a more effective pro-life activist. The book is written entirely from the first person perspective. Abby states in the preface that the ambiguity is intentional so that “you will not be able to distinguish one voice from another.” I found the ambiguity distracting. Part of the reason it bothered me so much was that at least three of the stories in the book are recognizable as stories from Abby’s own autobiographical portfolio. While they are written in more detail, they’re stories I’ve read before. They’re not identified as Abby’s stories, but the familiarity is unmistakable. Because of the universal use of first person as story teller, I found myself wondering if Abby had written the entire thing herself and just changed some of the details. As I read I was comparing story details to things I remembered reading before. While most of the stories were indeed new, it was definitely distracting. I think pseudonyms would have helped differentiate the stories more. The use of first person throughout detracts from the credibility, in my opinion. I appreciated that the stories were from such diverse perspectives. One predominant theme is how poorly women are treated, both the patients and the workers. It was eye-opening to read first person accounts from people who worked in abortion clinics. Telling these stories facilitates the paradigm shift pro-life activism needs in this country, a shift from condemnation to a mindset of compassion and rescue. Abby has been on the forefront of this evolution of thought from the moment she left the abortion industry. The Walls Are Talking is definitely a worthy read. I highly recommend it.